At the Christmas party we discussed “future facility opportunities” and wanted to give a recap. Most of you are well aware that we are very intentional in protecting our “Foyer Environments (Sunday worship experience)” at ridge church to make them guest friendly. We are very careful in what information we present, how we present information, and who we present information to. We want to continue to make this a safe place for you to bring your un-churched and formerly churched friends. As you know our mission is to lead people into a growing relationship with Jesus Christ. We feel like making the move to become a Sunday morning church is our number one priority currently because of the impact that it can and will have on the long term success of our mission. We have been fortunate to have an amazing amount of success meeting on Sunday nights, but we all know that it is not the optimal time to meet long term...especially for families with small children (amazingly we had almost 50 children at our last worship gathering in spite of the less than optimal night meeting). Unfortunately, Adam and I have become quite the “professional facility hunters” in the last year searching out at least 45 facilities to no avail. We are currently looking at a recently available 21,000 square foot furniture store. It is less than three miles from our current meeting location. We are negotiating with the owner currently and all of the initial communication, including the walkthrough with the architect have been very positive. Honestly, I don’t think any facility will ever be our destiny. Our destination maybe, but not our destiny. Plain and simple, people are our mission. From day one, this church has been about leading people into a growing relationship with Jesus and that will never change. We will never be defined by where we meet, but instead by who we reach. But, if this facility is part of “God’s plan” that will enable us to move to Sunday mornings, and step into our “mission” with a new and increased opportunity to influence people then I want us to pursue it with passion and commitment. I’m glad you asked! We need you to fully embrace the vision and mission of Ridge Church and place your shoulders under this church. In short we need 45 people to commit to percentage giving at Ridge Church in order for us this young church (11 public services young) to continue to move toward this facility with confidence. What we are considering is well within our reach but not without your help! This would be a 24 hour facility (No load in and load out! ), and among other benefits would also enable us to move to Sunday morning. We need to make a counter offer to the owner very soon. Will you pray and consider becoming a percentage giver to Ridge Church this year and let us know how you will participate in this incredible opportunity? Please feel invited not obligated to participate with us in this! If you do decide to partner with us you can let us know your decision by dropping a commitment card in the mail or by signing up online (takes two minutes!). Join us as a “Vision Partner”. We need to make a counter offer to the owner of the facility as soon as possible. Please remember that facilities come and go, but when a person’s life is changed by Jesus it is “forever”...people are our mission not facilities! **This is an exciting and incredible opportunity, and I want to thank you in advance for becoming “vision partners” with ridge church. 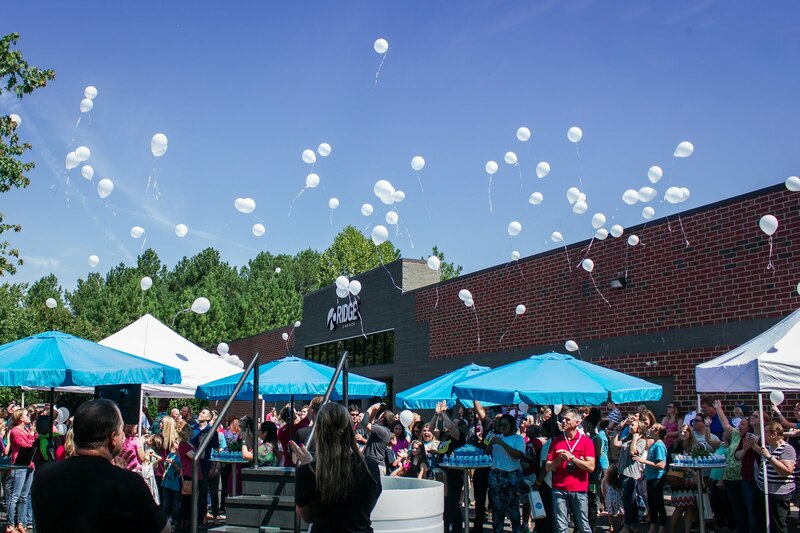 We look forward to what the future holds for Ridge Church...to the lives that will be changed! I believe God has great plans for this city and we have the unique opportunity to be in rhythm with what God is doing. Last night 53 ridge church volunteers met on the 31st floor, Charlotte City Club in uptown Charlotte for our first "Volunteer Christmas party." It was truly an amazing night, and inspirational backdrop overlooking the city skyline at night. It was the perfect place to be able to enjoy and celebrate our volunteers and what they give to make this dream a reality. There were many days that we would have been be overjoyed to have that many adults show up for church...having that many volunteers is a blessing and a great sign of what is to come. So it was a fun night celebrating with the people that have placed their shoulders under this young church (11 public services young to be exact!). Great things ahead for this church. You will enjoy the video Rusty put together as our way of saying, "THANKS" to all that serve here at Ridge Church. Thanks for believing in this mission! Deep Theology in the mini-van? The kids were talking about Christmas---they can't contain themselves---and Josie kept saying, "No, not the 'big Jesus' the 'baby Jesus' " Finally I asked her what she meant, and after a bit of digging I realized that in her mind they were two separate people all together. Kind of funny, and kind of cute, but worthy of clarification--I'm sure you would agree! I pray for those moments and conversation frequently. One of my most frequent prayers actually. It was one of those unplanned "God moments" where I was able talk in detail with my children about what it means to believe in Jesus. We talked about everything from why Jesus was born as a baby, to why he died, to how he wants to live in our hearts. That one is really fun to explain to six year olds:-) I'm an adult and still haven't wrapped my mind around it. At one point it was very serious. The part where I tried to explain that Jesus was coming back one day and would eventually take every one who believed in him to heaven. With much concern and all joking aside, Josie asked a legitmate question that we have all wondered, "WHEN IS HE COMING?" When I told her that I didn't know exactly when Jesus was coming back-- it could be today, tomorrow, or many years from now, her interest in Jesus was at an all time high! Most people aren't all that different from my daughter. Isn't it true that it feels like something we can do later...we can always figure out religion, deal with spiritual stuff, explore Jesus later. There will be time for it in the next season of life, after school is done, after you finish that next project, after the kids are out of diapers...After all the guy hasn't been seen for a couple of thousand years right, so what does it matter to wait awhile? But, the even better question is even if there is "plenty of time" why would we wait to experience life on earth lived with Jesus? Why not upgrade your life now? Why not receive the new life of Jesus offers now? It is incomparable. There aren't any really good reasons to wait when you really stop to think about it. "So daddy is Jesus' beard white or brown?" DEEP THEOLOGY IN THE MINI-VAN! My family spent the day together today and one of our stops was the mall. I saw alot o f shoppers. Some in the mall, some in the parking lot with shopping bags in hand, ready to head home, while others were taking a meal break in restuarants. BUT, for the most part they didn't seem very "happy" if you know what I mean. I saw road rage in the parking lot over that one open space, and kids crying at every turn. I saw lines so long that it was stressfu l just to walk by them. I can't imagine actually being in one! But every person in the pictures is really happy, and we should be too right? Couples smiling at each other...families happy with no apparent tension or sibling rivalries...and what's up with the smiling couple with bags and stacks of gifts? I wonder if they know how much money they just spent...and if so why are they still smiling? I'm just poking fun, but the reality for many people during this time of year is over spending, the fear of having to go to a family gathering where "all isn't well", marital frustration, STRESS etc. It's a bit ironic that the angels announcement about the Christmas Season (Jesus birth) was "Glory to God in the highest, and peace on earth..." If we truly embraced the message of Christmas, peace would be our reality, not just the "staged pictures." That is what our current series at Ridge Church, "Choosing Christmas" is all about. If you could use a little more peace in your life, or know someone that could, then you need to make plans to be at Ridge Church for this series. See you soon.